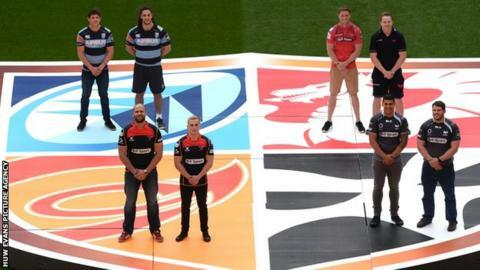 Wales' regional derby double-header has been confirmed for Saturday, 30 April at Cardiff's Millennium Stadium. Cardiff Blues will face Ospreys in the first match at 14:30 BST, followed by Newport Gwent Dragons against Scarlets at 17:00 BST. The first match will be live on BBC Two Wales, with the other on S4C. The event, known as 'Judgement Day', has been confirmed until 2020 under the Rugby Services Agreement, signed in August last year. "The aspiration for Judgement Day has always been to fill the stadium to its rafters," said Welsh Rugby Union chairman Gareth Davies. Mark Davies, chief executive of Pro Rugby Wales, which represents the four professional teams, said: "We showed this year what can be achieved when all four pro teams, Pro Rugby Wales and the WRU work together successfully, achieving a record crowd that the professional game in Wales was rightly proud of."